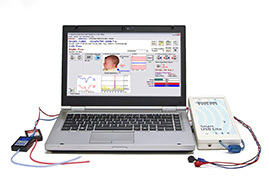 An affordable auditory brainstem response and otoacoustic emissions newborn screening system. The SmartScreener-Plus 2 is the most cost effective, complete, and easy-to-use infant hearing screener. The system offers you a choice of automated ABR screening, OAE screening, or both. The device is simple to operate and does not require special technical skills or interpretation of results by the device operator. Best price for equipment and disposables supplies, such as the EarHug sound couplers. Highly ergonomic and integrated Screener Cart configuration. Battery operation (don’t miss babies if you do not have access to a power outlet). Simple hardware and software user interface. Multiple security levels and password protection. Built-in System Maintenance Utility program. Customizing of forms, extended hour support, data analysis. 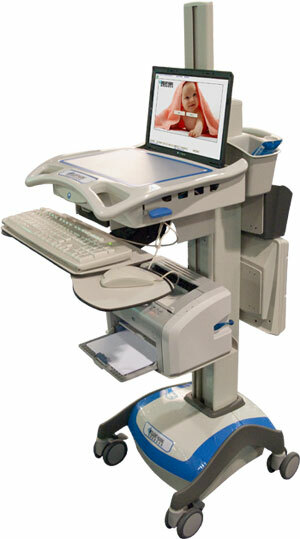 The screener cart with its superior ergonomics design, and comprehensive set of features, is ideal for use at point of care. Oversized work surface with raised edges and document cover. Integrated keyboard and mouse surface, includes keyboard light for low-light locations. Contoured handles and compact base for easy maneuverability. May include locking drawer, file bins, and supply bins for added storage. Narrow base with built-in isolation transformer. Smooth non-porous surfaces for easy cleaning and durability. Coiled power cord for easy cable management. Best in class support provides next business day on-site service and parts for the screener cart. Small form factor and portability makes the USBLite platform is the ideal hardware for screening applications. If you need additional information, please contact us. Download the brochure for additional information about the SmartScreenerPlus2 product capabilities; and the acquisition of screening auditory evoked potentials and otoacoustic emissions in newborns and infants. This application note reviews the basic principles of acquiring auditory evoked potential infant hearing screening using click stimulation. Includes the recommended placement of electrodes and the EarHug sound coupler. The data acquired during the screening process can be pooled into a report that simplifies analysis. These tool makes it easier to identify trends, find possible improvements, and identify the need for personnel training.